First off, I think it would be safe to say that TalesFes 2013 actually started on March 31st at around 10:00 am with the early opening of their food and merchandise section. They had some of the merchandise scheduled to be sold (see the full list here) out already, as well as an exhibition hall for current and upcoming Tales of merchandise. 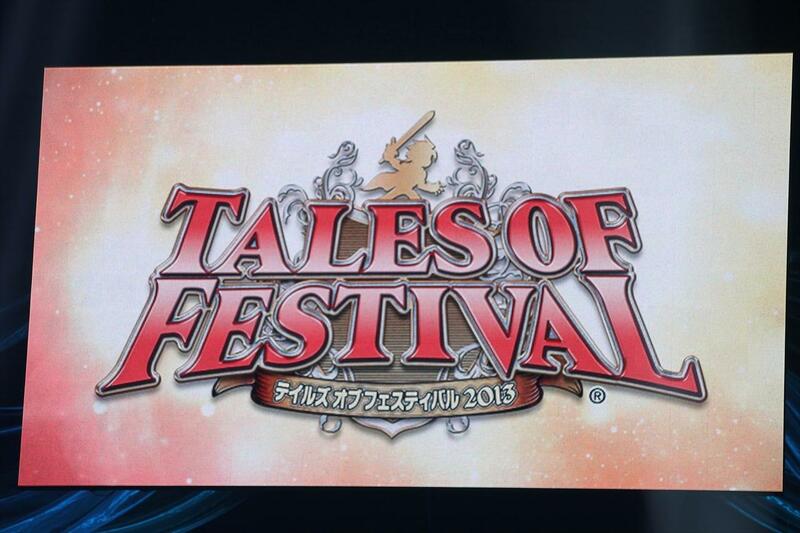 This pre-opening event was available even to those who didn't have TalesFes tickets. 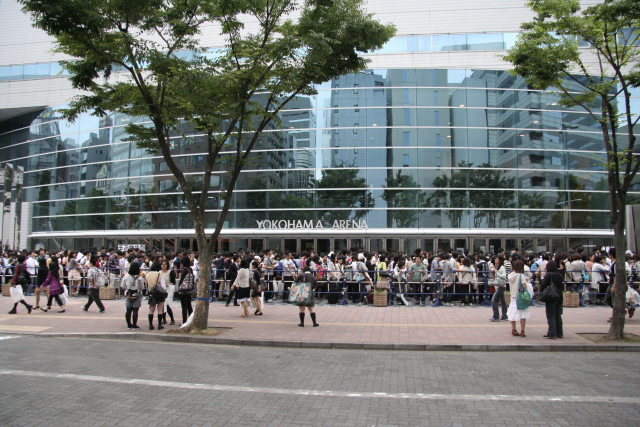 As expected, lines were extremely long, with Tales fans surrounding Yokohama Arena. 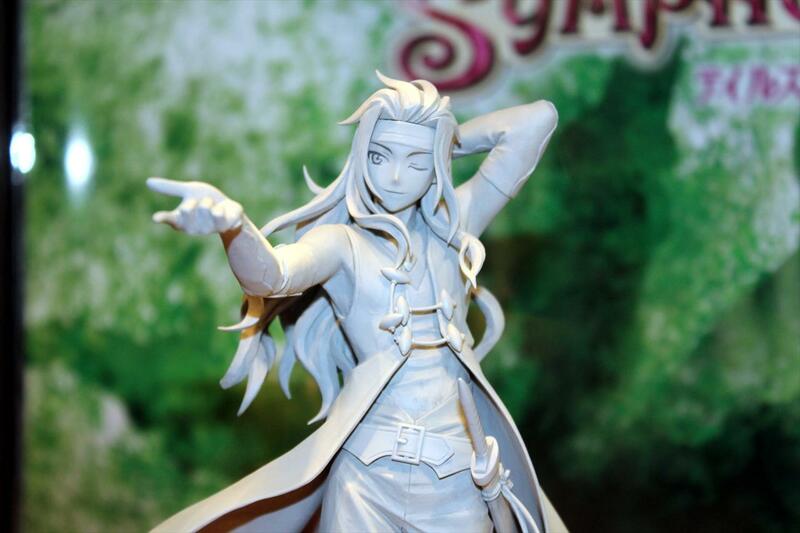 During this, we got word on 1/8 Scale Tales of Symphonia Zelos Wilder and Lloyd Irving figures from Alter/ALTAiR. Along with that were figures of Leon Magnus (Tales of Destiny) and Milla Maxwell (Tales of Xillia 2) from Banpresto. These figures are for their Ichiban Kuji lottery in Japan. You can view more pictures of the figures here. 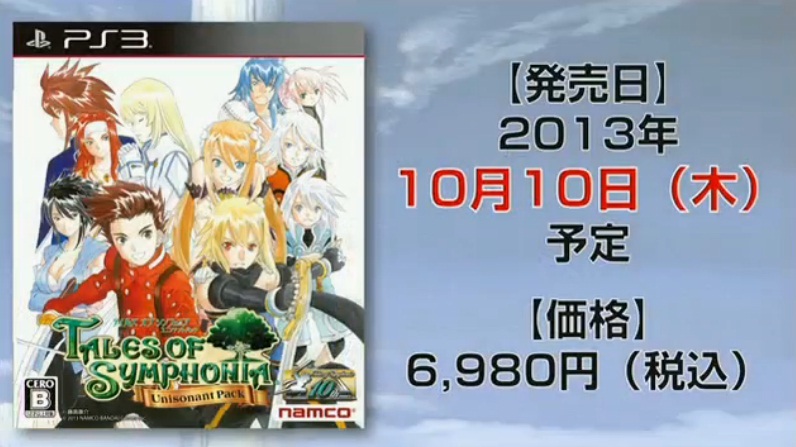 Other merchandise already announced before were also being showcased there. The Chibi Kyun Chara figures are apparently for Banpresto's CraneKing game (it's a crane game). 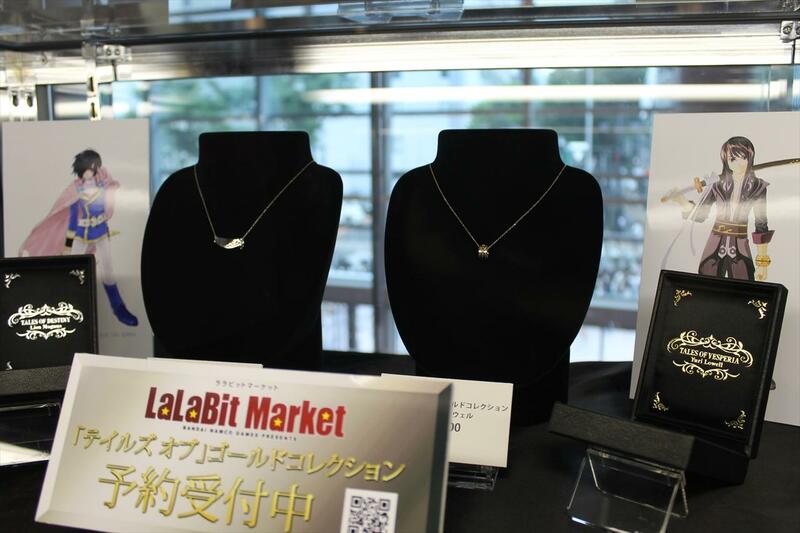 Aside from this, Lalabit Market also showcased their new Tales of Gold Collection accessories, which are basically re-releases of their Tales of Vesperia Yuri Lowell and Tales of Destiny Leon Magnus necklaces, but this time made of actual 10 carat gold (and precious stones). An Emil Castagnier-themed necklace and a Lloyd-themed Exsphere bangle were also announced. As usual, Lalabit Market is a Japan-only store so you'll need either a shopping proxy or a friend in Japan if you want to order. Each of them costs 31,500 Yen though. That's roughly $300 each. But then again, it is gold, so... Anyway, there were also some new Tales of Xillia 2 shirts and Ludger's pouch thing. You can check them out over at Lalabit here. 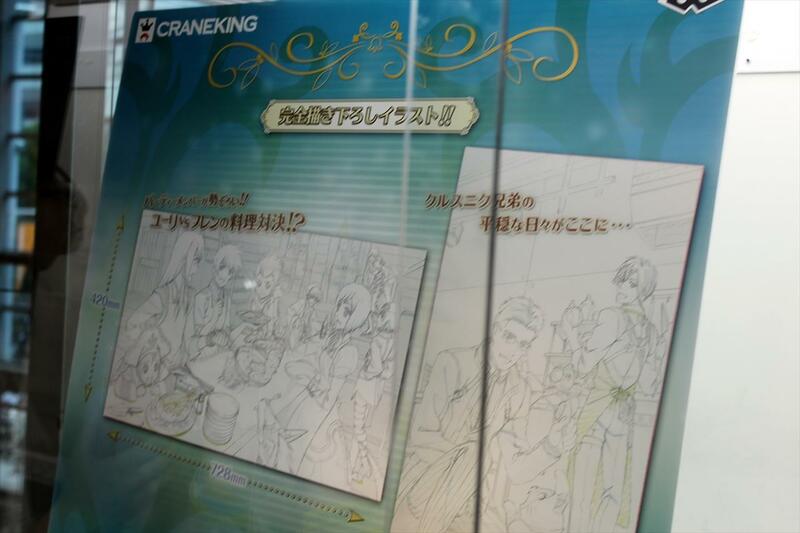 Also part of CraneKing's prizes are these illustrations - one is of Yuri and Flynn having a cooking battle (this can never end well) and one of Ludger cooking while Julius plays with Lulu. Later that night, a few lucky people also had a dinner party, with Baba-san also being at said party (Picture from Ladyusada who was one of the lucky people to be there). 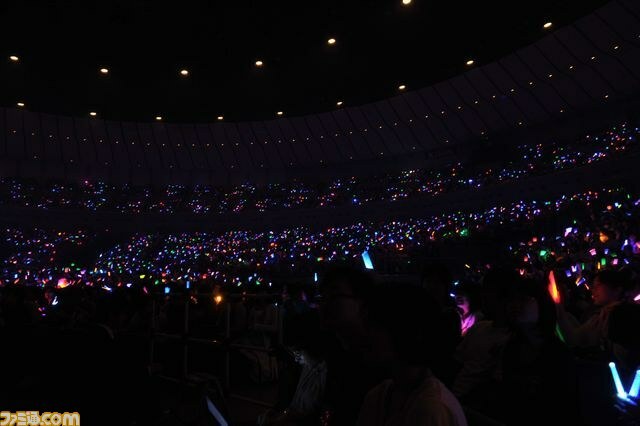 Day 1 of TalesFes was amazing - with an estimate of 12,000 people filling up Yokohama Arena. The event was setup as a center stage, with fans surrounding it in all 360 degrees directions. 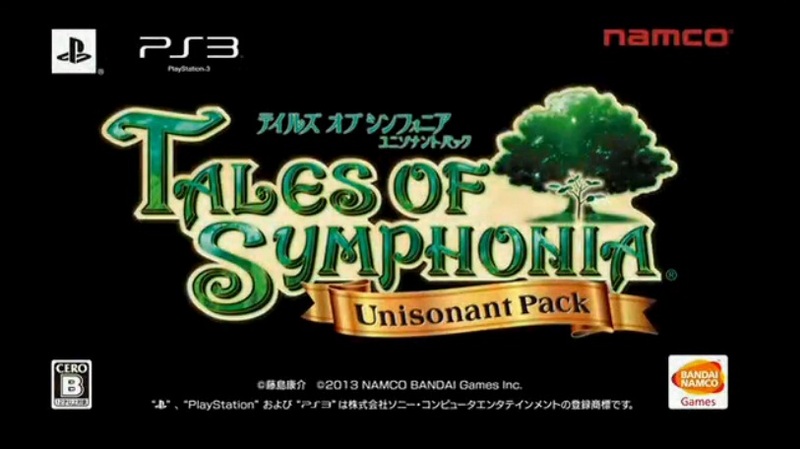 Day 1 started out with the opening movies of the various Tales games being played in order of release. 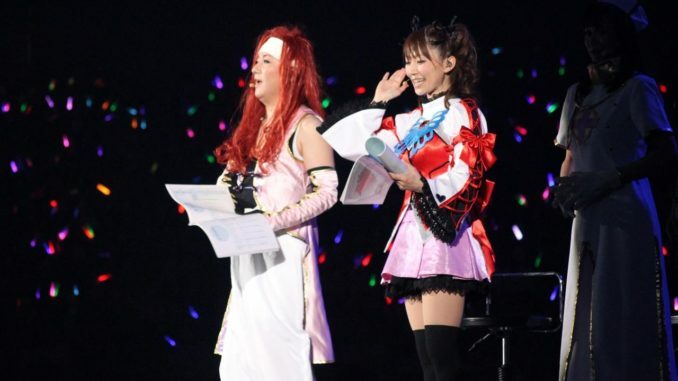 The main hosts for this year were Masaya Onosaka (Zelos Wilder - Tales of Symphonia) and Shiho Kawaragi (Cheria Barnes - Tales of Graces), clad in cosplay of the characters they voice. Once on stage, Onosaka first "tries to find a good place to stand on" since the stage is a center one, and upon deciding on a spot, does a pose. He also mentions how he's jealous of how high level and complete Kawaragi's costume is. 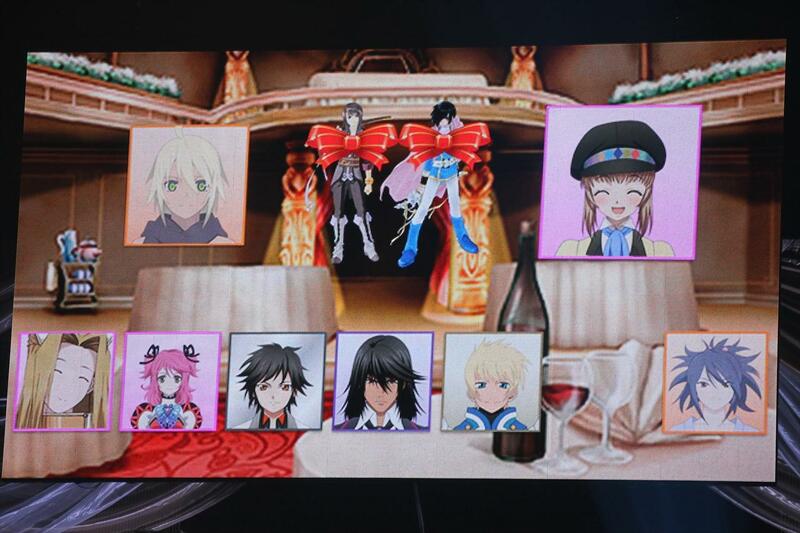 It was then followed by the special skit of the day, "Tales of Party ~The Celebration Is For Who~." 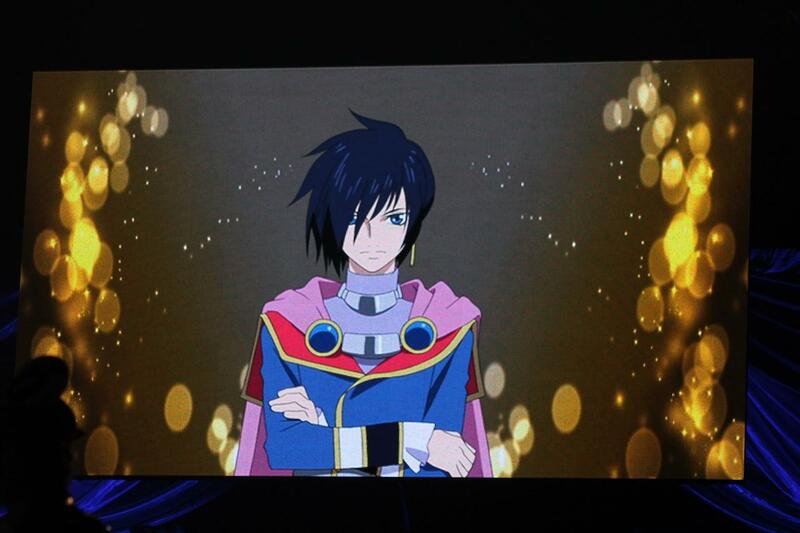 The main gist is that apparently, Leon Magnus (Tales of Destiny) and Yuri Lowell (Tales of Vesperia) have made it into some sort of "Hall of Fame" for always being in the top of the recent Tales of Series character popularity ranking polls, and as such, a party's being held for them. Leon and Yuri's voice actors, Hikaru Midorikawa and Kosuke Toriumi, respectively, were there to voice their characters. And they actually start of the skit... with a battle. The next day, we have Mint Adnade (Tales of Phantasia, Junko Iwao, also in cosplay of her character), Cheria and Leia Rolando (Tales of Xillia 2, Saori Hayami) appear. They're apparently reading a newspaper about Leon and Yuri, but it gets flown away when a monster attacks them (voiced by Mamoru Miyano). 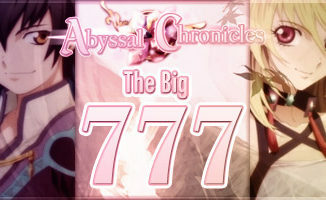 They assume the article was about Leon and Yuri entering the Hall of Fame of the Tales of character popularity ranking, so they decide to throw the two a party. Zelos and Lloyd Irving (Tales of Symphonia, Katsuyuki Konishi, also in a Lloyd cosplay) overhear this and for some reason misunderstand this as the girls planning a "goukon" (a group date). Of course, they won't allow that to happen. Basically, they gather people to join the party. This starts off with Mint and Jude Mathis (Tales of Xillia 2, Tsubasa Yonaga, wearing a Jude-style coat that was sold before in collaboration with a popular Japanese clothing brand) bringing along Dymlos (Tales of Destiny, Ryoutarou Okiayu, in the most epic cosplay ever) - who changes into Gaius (Tales of Xillia 2) by removing his Dymlos headgear and replacing it with one saying "Ga" in hiragana. 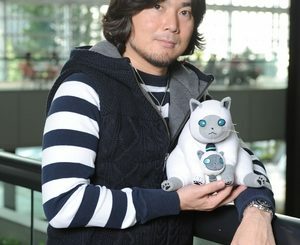 More people join in, namely Sheena Fujibayashi (Tales of Symphonia, Akemi Okamura) and Emil Castagnier (Tales of Symphonia: Dawn of the New World, Hiro Shimono). 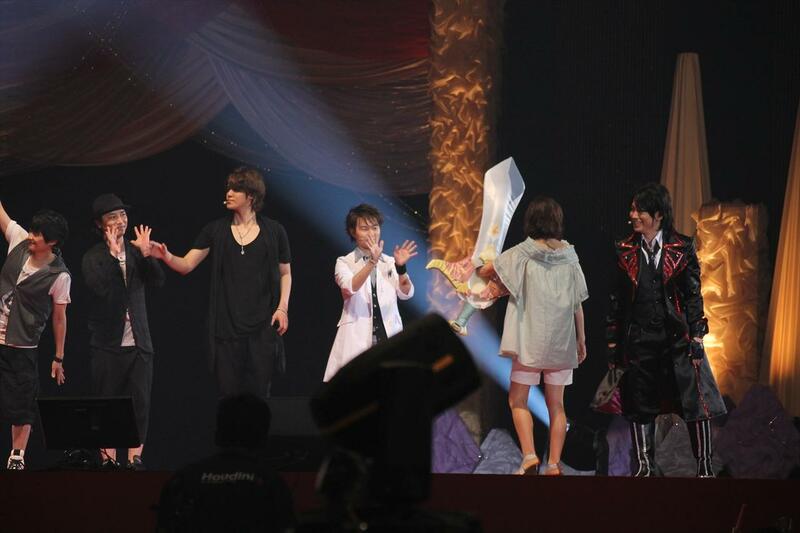 Unfortunately, Flynn Scifo (Tales of Vesperia, Mamoru Miyano) could not join at that time because of knightly duties. 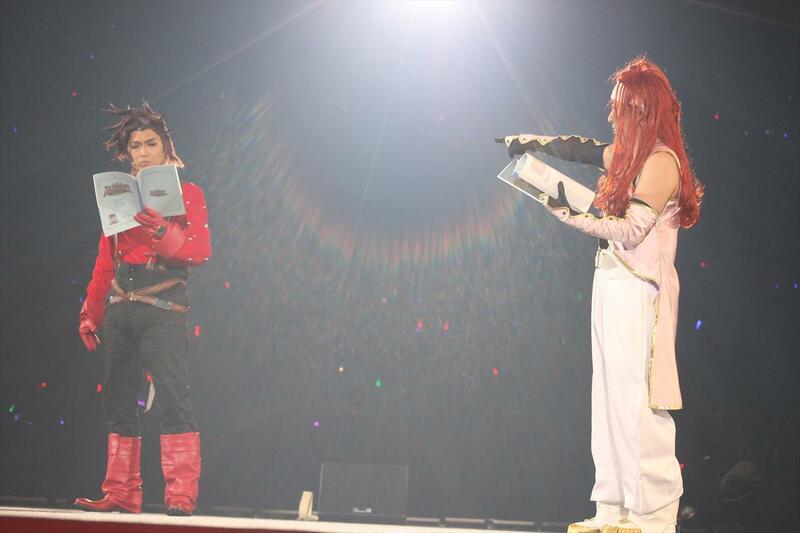 Exceptional cheers were given to Okiayu's Dymlos/Gaius costume. Also, this year, they now have proper lapel microphones, compared to last year where they had to hold the microphone, so hand gestures and such looked much better. So at the party venue, everything seems ready. Mint, Cheria and Leia are in charge of decorations, and Flynn also comes rushing in saying his knight duties have ended and that he brought cake made by Estelle. Sheena and Emil arrive with life-size Yuri and Leon dolls... hidden in these dolls are Lloyd and Zelos. So, Leon and Yuri arrive and are greeted with congratulations... but somehow the atmosphere's a bit off. The two then explain that the newspaper article was actually about the both of them going overboard in a Battle Tournament of sorts and destroying the arena. 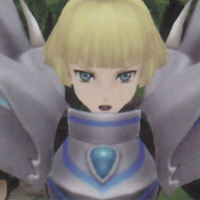 Leon's pissed and about to leave, Zelos and Lloyd try to stop him, but Yuri mentions that they should celebrate something else since the party's all prepared anyway - Tales of Symphonia's 10th Anniversary. So they celebrate anyway. Zelos, Lloyd and Sheena try the cake, but it tastes horrid, apparently. Though it was Estelle who made the cake, it was Flynn who did the topping, so you can pretty much guess what's wrong. Even Emil got involved by being forced to eat some cake, which made him go into Ratatosk Mode. The skit ends with Ratatosk-Emil yelling "Don't turn me into the punchline!!!" 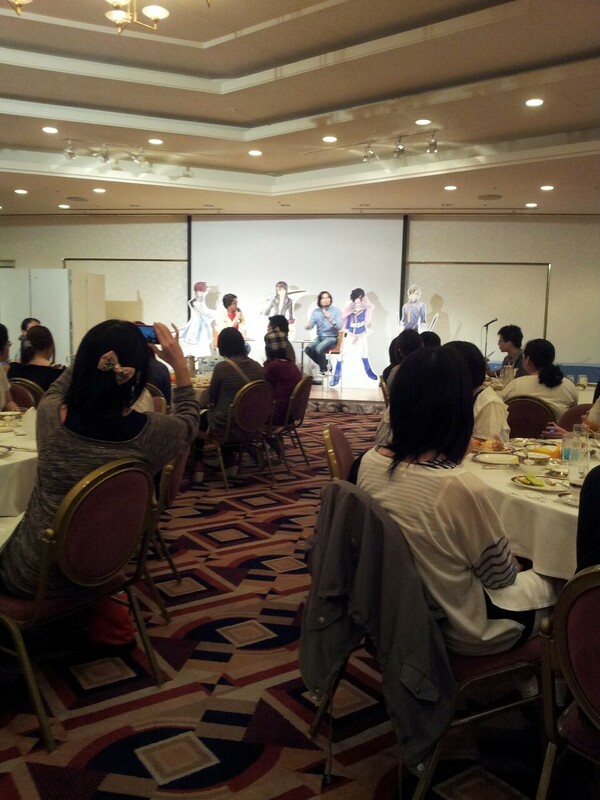 This is followed by free talk by the voice actors. 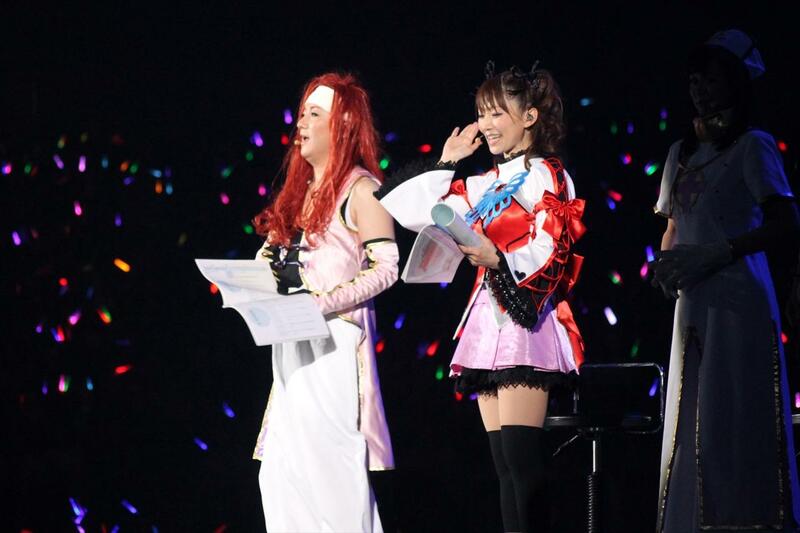 They open it up with how this is Iwao's, Okamura's and Hayami's first time being at a TalesFes. Iwao mentions that it's amazing with a smile, and apparently her Mint costume is something a fan made for her as a present. 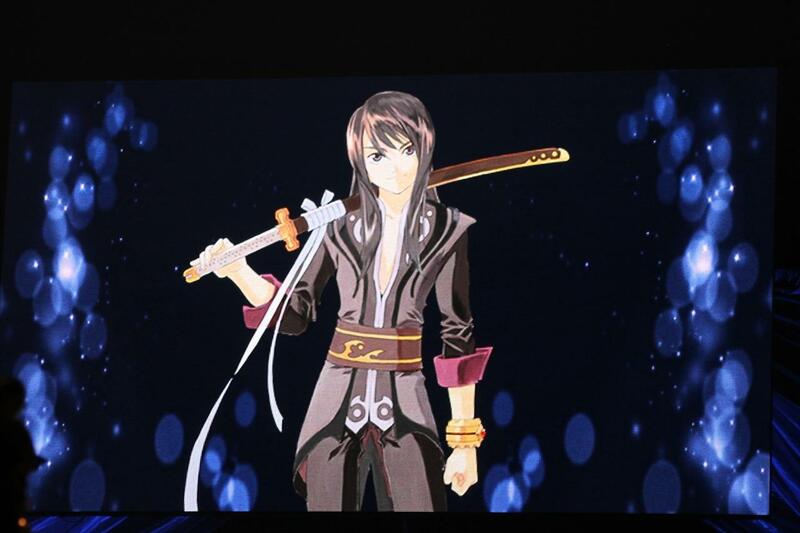 Onosaka mentions that he'd also like his own costume remade, since he's been using the same thing since last year. Okamura's comments on the skit include it being fun and her being unable to contain her laughter at Zelos. Hayami says it was tense, but still fun. Also, apparently in the middle of the skit, Onosaka was staring at Hayami's legs and thinking that, well, she had great legs. The guys shield her from Onosaka, particularly Okiayu who uses the Dymlos headgear to hide her legs. 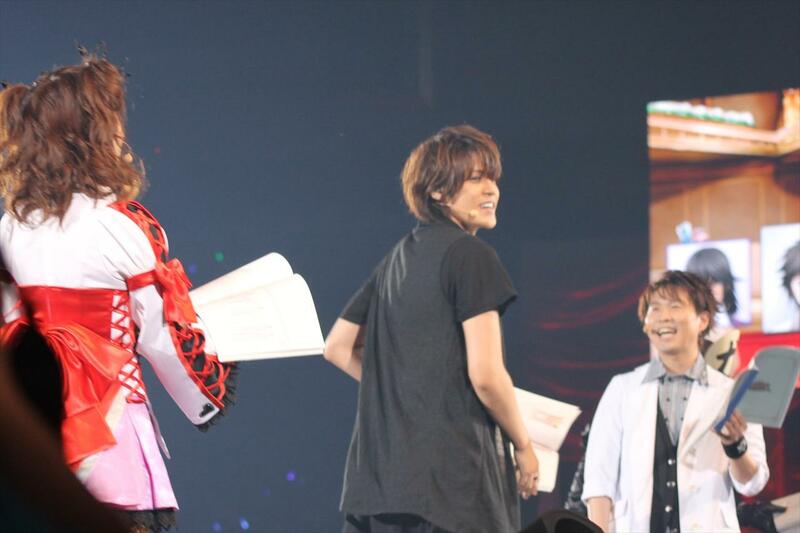 They also poke at how Midorikawa and Toriumi still aren't cosplaying their characters this year. Midorikawa replies that if it's just Judas's mask and mantle, he will, and this gets a loud cheer from the audience. Toriumi says he really won't, but maybe he'll try acting left-handed like Yuri is. Miyano yells out that he'll cosplay Flynn if they make him a costume. 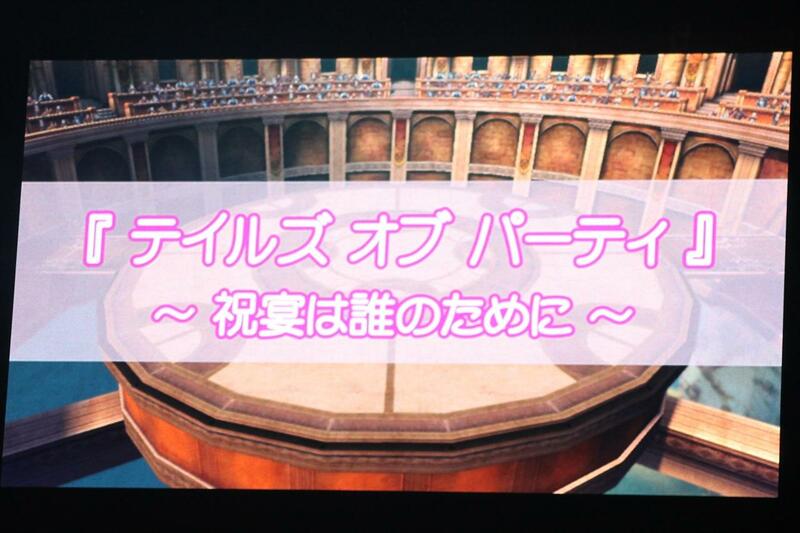 The free talk was followed by a "You Think Of It - TalesFes 2013 Event Planning" segment. This was apparently done in Viva! 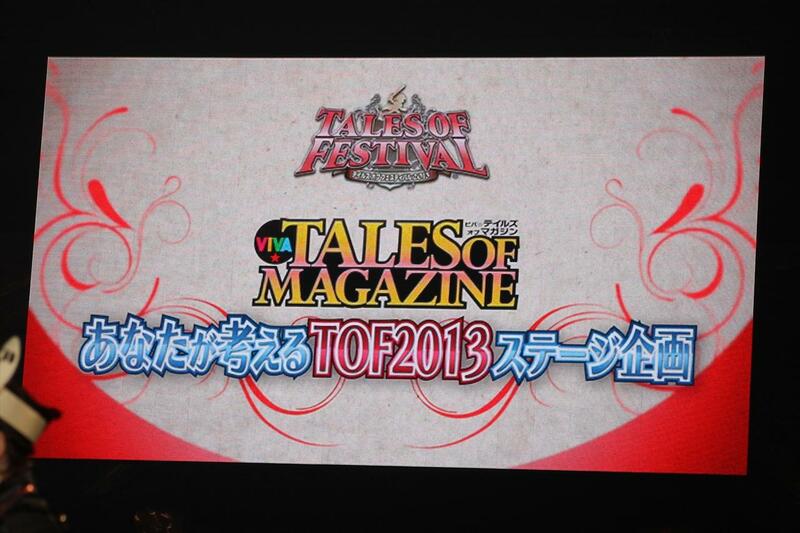 Tales of Magazine, where they asked their readers what events they want to happen during TalesFes 2013. There were a lot of ideas, but the one that got adapted was placing Leon and Yuri in a Hall of Fame and giving them a party because of them constantly being in popularity polls top rankings - Leon has been in 1st place twice, and in second place four times while Yuri has been in 1st place for three consecutive years. However, the downside of being included in the Hall of Fame is that both Yuri and Leon will not be included in the future Tales of Character Popularity Ranking Polls. 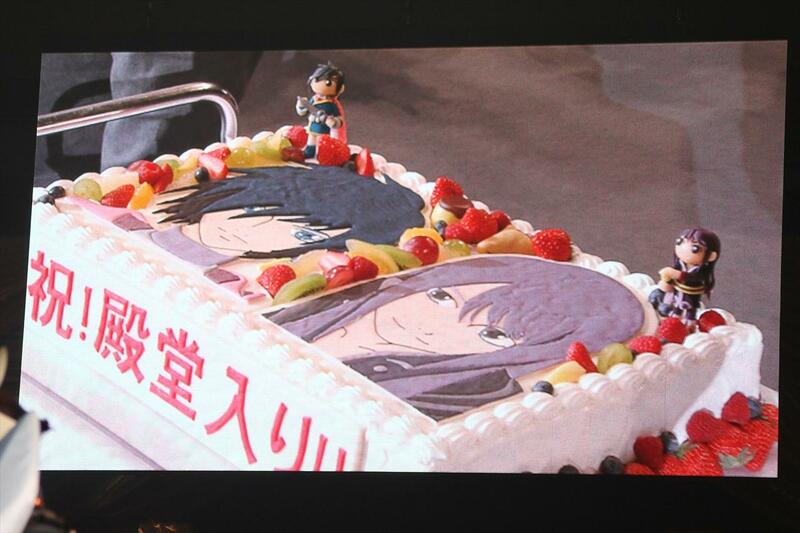 A beautiful cake featuring Leon and Yuri's artworks were brought on stage. Notice the little marzipan figures of the two, some fruits, and even pudding on Leon's side. There's also something on Yuri's side but I can't discern what it is. 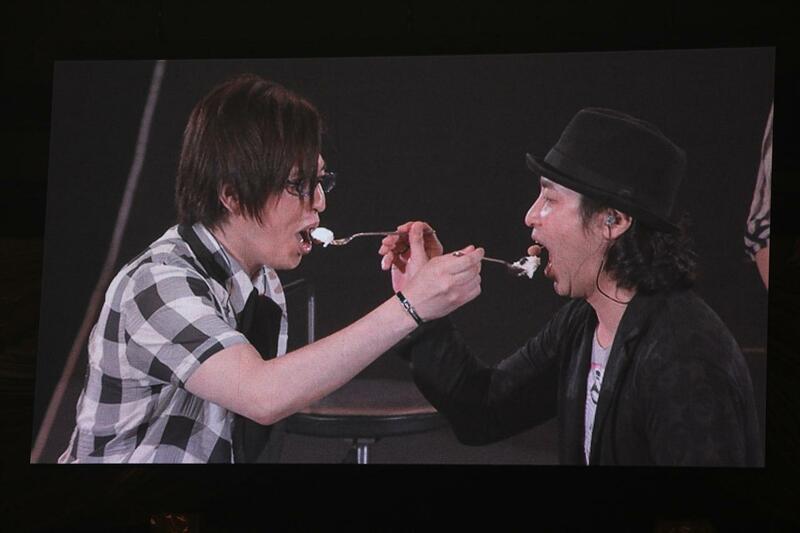 Anyway, after taking some photos, the cake being sliced by Midorikawa and Toriumi, an exchange of bites, all the voice actors then had some cake. They also took a look back at the previous polls' results. 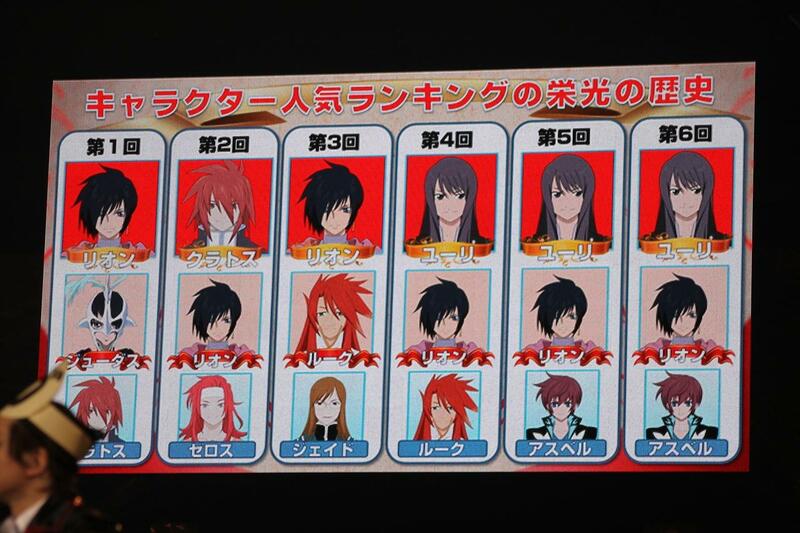 Only Kratos Aurion (Tales of Symphonia) was able to break the Leon and Yuri's 1st place streak. Midorikawa comments that Leon's popularity can be attributed to his unfortunate circumstances, as well as the illustrations of him made by Mutsumi Inomata. He also admits that back when he was still at his parents' place, he was a big fan of Inomata's work. As for Yuri, Toriumi comments that there are a lot of heroes already that have righteous principles, so it's Yuri's "un-hero-ness" that makes him popular. This also includes his somewhat dark image and his influence to make the people around him grow. 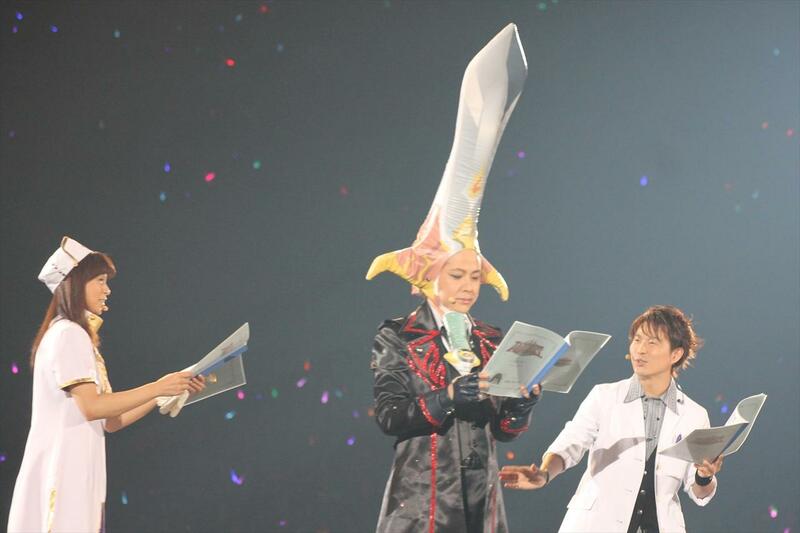 After this, Midorikawa and Toriumi read letters of appreciation they made. 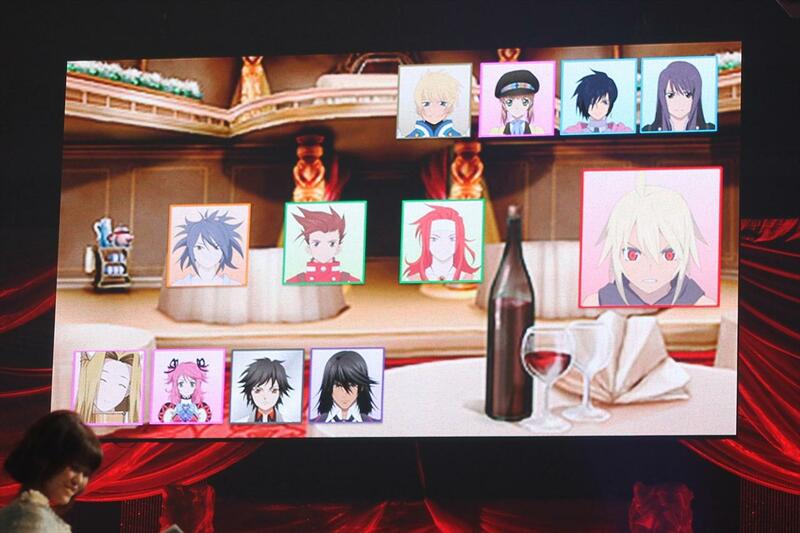 That said, though it hasn't been finalized yet, it seems Yuri and Leon, now not allowed to join the polls, will become moderators in the upcoming 7th Tales of Character Popularity Ranking Poll. 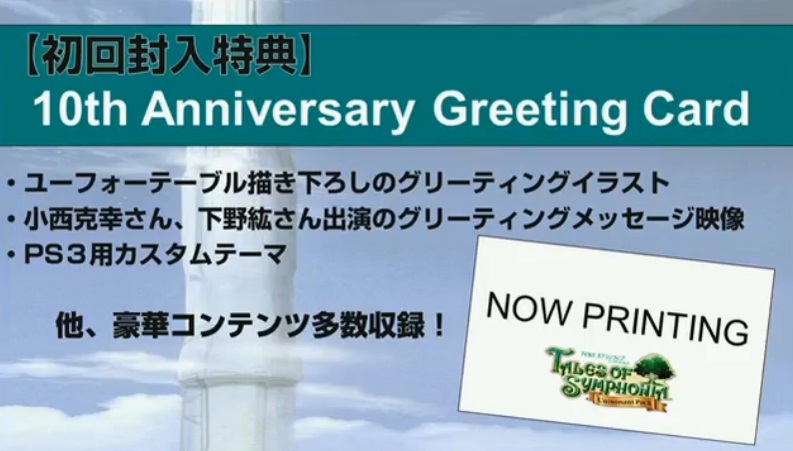 First off, pre-order bonuses: A special 10th Anniversary Greeting Card which will have art by ufotable, a message from Katsuyuki Konishi (Lloyd) and Hiro Shimono (Emil) and codes for a PS3 custom theme. When the release date was announced, Onosaka says that his birthday is on October 13th. He adds if maybe Baba-san can release it on his birthday, but that would be difficult. So he asks, "Can I have it as a gift instead?" to which Baba-san replies "Of course!" All of the Symphonia announcements were followed up by misono's live performance. The songs she sang were "Ninin Sankyaku" (Three-Legged Race, Tales of Symphonia: Dawn of the New World's opening), "VS" (Tales of the Tempest opening), "Ho?n?to?u?so" (True Lies, Tales of Symphonia the Animation: United World Episode opening), "Soshite Boku Ni Dekiru Koto..." (What I Could Do Then..., Tales of Symphonia PS2 opening) and "Starry Heavens" (Tales of Symphonia GameCube opening). The last song was "Tales...", a song from Tales with misono EP. 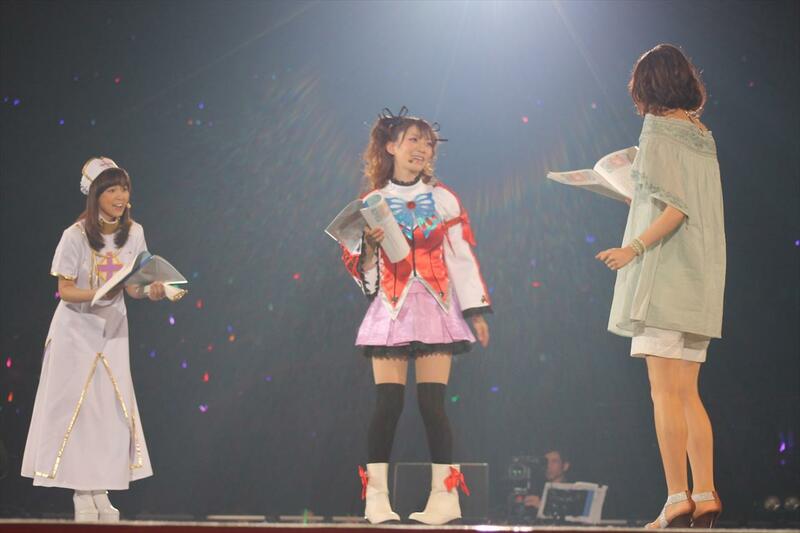 After the live, she announced that her next CD will be released on October 9th, 2013. This will include the new arranges of Starry Heavens, Soshite Boku Ni Dekiru Koto... and Ninin Sankyaku, as well as two new songs. For those new songs, former Day After Tomorrow member Daisuke Suzuki (now a member of GIRL NEXT DOOR) will be helping her out. She also mentions that those are to be done in the consciousness of Day After Tomorrow, and she will be singing it with her Day After Tomorrow vocals in mind. Day 1 was closed with a message from each voice actor, as well as their impressions of the event so far. And there you have it! Stay tuned tomorrow around this time for Day 2! Sorry if I have to divide them, they're quite extensive. There are a WHOLE LOT MORE of pictures over at our gallery!